The Eurozone’s trade surplus in September more than doubled to €18.5 billion compared to €8.6 billion in August , according to data published on Monday by Eurostat, the EU’s statistical agency. When a country or region exports more than it imports it has a trade surplus, the other way round is a trade deficit. Imports and exports form part of international trade. September 2014’s trade surplus in goods was nearly eight billion euros higher than in September 2013 (€10.8 billion). In September, exports of goods increased by 4.2% and imports by 3% compared to the previous month. 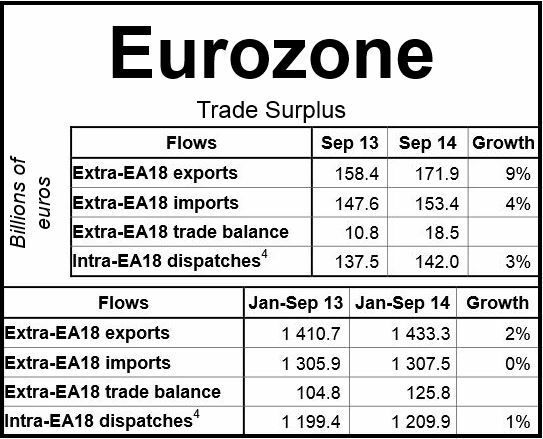 The trade surplus in goods in September for the whole of the EU, including the non-Eurozone members, known as the EU28, was €2.6 billion, compared to a -€8.8 deficit in August and a -€0.7 deficit in September last year. Exports in September increased by 5.8% and imports by 3.2%. The European Union’s exports to Russia declined by 12% during the first eight months of 2014 compared to the same period last year, while imports fell by -8%. Source: “Euro Area International Trade in Goods – September 2014,” Eurostat. Since the annexation of Crimea and allegedly supplying Ukrainian separatist rebels with military equipment and personnel, the EU has imposed anti-Russian economic sanctions. According to Eurostat, imports of energy into the EU fell by 9% in the first eight months of 2014 to a total of €230.6 billion. Europe’s biggest supplier of natural gas and oil is Russia. The EU28 posted a 10% increase in exports to China during the Jan-Aug period, compared to Jan-Aug 2013. Over the same period, exports also rose strongly to South Korea (8%) and the US (4%). Imports into EU28 grew by 9% from South Korea, and by 5% from both China and Switzerland. Apart from Russia, the most notable declines in exports by EU28 in the Jan-Aug period were to Switzerland (-23%) and India (-9%). Imports from Brazil fell by -5% and from Norway by -8%. Regarding total trade by EU member states, Germany (€138 billion) posted the largest surplus for the Jan-Aug period, followed by the Netherlands (€38.5 billion), Italy (€26.2 billion), Ireland (€23.2 billion), and the Czech Rep. (€10.8 billion). The UK registered a deficit of -€89.8 billion, followed by France (-€49.3 billion), Spain (-€16.6 billion) and Greece (-€13.6 billion). International trade refers to imports and exports of products and services, i.e., countries purchasing and selling things to each other.